Sailors' Society chaplains and ship visitors reach out to 1,000 seafarers and their families each day. 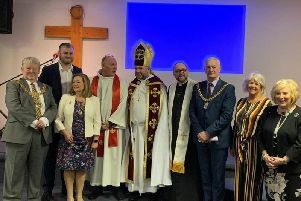 One of the UK's biggest maritime welfare charities is calling on churches across Burnley, Pendle, and the Ribble Valley to remember the world's seafarers in a special service on Sea Sunday. Always held on the second Sunday of June, Sea Sunday sees many Christian churches pay tribute to and pray for seafarers and their families in order to give thanks for their lives and work, with charity Sailors’ Society asking churches across the North West to lend their support on June 14th. “Whether they know it or not, people rely upon seafarers," said Sandra Welch, Sailors’ Society’s deputy CEO, with the charity reaching out to 1,000 seafarers and their families every day. "More than 90% of everything we own comes by sea – our clothes, phones, cars – even the bricks that make up our homes. A Christian charity, Sailors’ Society celebrated its 200th birthday in 2018 and is asking churchgoers to pray and give thanks for the world’s 1.6m seafarers. The charity has also created a variety of free resources for churches (those wishing to receive a pack are advised to email jleslie@sailors-society.org).